It’s a specific kind of irony that most major menstrual hygiene companies are run by cisgender men. Unless you yourself menstruate, how can you possibly know what kind of menstrual hygiene products to make? That’s why we’re so grateful for all the women-owned and operated menstrual hygiene companies that have sprouted up over the last few years. These women founders understand what someone who menstruates needs. Because of that, exciting new innovations are available, like reusable tampon applicators and alternative products, like the disposable menstrual disc. 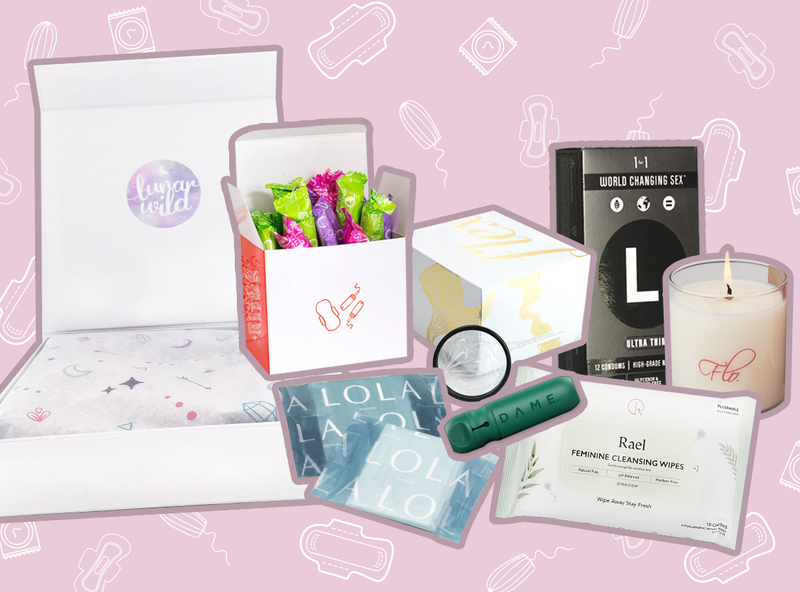 So before you head to Target to buy your monthly supply of generic, chemical-laden menstrual hygiene products, look into these eight women-owned companies and discover healthier, tailor-made products that fit your needs with the health of your lady parts in mind. Today is the perfect day to do your research, too, since it’s Menstrual Hygiene Day. You can get tampons, pads, liners, cramp care, condoms, lube, and wipes from LOLA. The gender-neutral menstrual hygiene company, founded by Claire Coder, is all about making tampons as accessible as toilet paper in public and professional places. We asked Claire why it’s important to buy from female-owned and run companies, and she said the relatability factor is an important aspect. "Eighty-six percent of women have started their period unexpectedly in public without the supplies they needed. I experienced this firsthand, and that is why I founded Aunt Flow," Claire said. "Toilet paper is offered for free, why aren't tampons and pads? Aunt Flow stocks 100+ businesses across North America with our 100% organic cotton tampons and pads. We are the only company that works directly with businesses and schools to ensure their bathrooms are up to par and supporting menstruators." You can get tampons and pads from Aunt Flow. The company, founded by former Red Cross photojournalist Talia Frenkel, works with a network of over 2,800 female entrepreneurs to donate millions of health products to women in need around the world. "It benefits everyone to support female founders across all categories. At L., we focus on lifting up women at every stage of the process, from how we source, to our messaging and ultimately how we give back. We make products by women, for women, with the quality you expect and the authenticity you deserve. And it’s working! L. sales have resulted in making 100 million products accessible to girls who need them. It’s past time women’s health is made a priority. When we stop shaming women for the natural and universal cycles of their bodies, we make room for educational, economic, and social opportunities. Because periods should only end sentences — not education and opportunity." You can get tampons, liners, pads, and condoms from L.
DAME was founded by two friends (one male, one female) with the shared belief that consumers will make the greatest impact on the planet. Their theory is that if buyers are offered the choice of high-quality products that do not cost the Earth, we can all build a better world. That’s why they developed a reusable (and safe!) tampon applicator. You can buy DAME’s reusable tampon applicator, as well as organic tampons, from the company. This chemical-free menstrual company emphasizes the importance of knowing exactly what is in your period products. "After I had my first child, I really wanted to be conscious about using healthy products — for myself, for my family, and in my home. When it came to menstrual pads, I found that there were so many organic options out there, but none of them actually worked. They might have been good for my body, but they didn’t perform for my period, many times being even worse than conventional pads. I couldn’t find a single organic period product that worked for my postpartum needs, so we decided to make one." You can get pads, liners, tampons, washes, wipes, underwear, and facial sheet masks from Rael. "I wondered to myself, 'Is there a box out there specifically for young women that contains mindful menstruation products and sacred literature about becoming a woman? Are young women being taught self-care, intuitiveness, and how to celebrate their bodies and natural cycles?' That’s when Lunar Wild was born." Lunar Wild currently focuses solely on their period gift box. Flex currently focuses solely on their disposable discs. Love Your Flo currently focuses solely on their candle. Here’s to the cycle () of women supporting women by providing and purchasing menstrual hygiene products!